5. Avantika and Imran Khan- Imran Khan, the cutest actor of Bollywood,nephew of famous actor Amir khan and Avantika Malik, daughter of CNBC head honcho Vandana Malik. Imran Khan began dating Avantika Malik at the age of 19 and had an intimate affair and tied a knot on January 10 2011 in a private civil ceremony at Aamir Khan's home in Pali Hill, The pre-wedding functions were at Avantika’s farmhouse in Karjat, the wedding turned out to be a glitzy and glamorous affair! Every function this couple hosted had Bollywood stars and celebrities from all walks of life pouring in The wedding reception was arrange by Amir Khan and Kiranrao at TajLands End in Bandra on February 5 2011 which saw the most powerful personalities of business and Bollywood. They had the grand Black & Silver theme. It is believed that to avoid any untoward incident and ensure the security is up to the mark, the guests were given swipe cards to enter the venue. The biggies of the entertainment industry attended this function. From Shah Rukh Khan and wife Gauri to RanbirKapoor, Katrina Kaif, DeepikaPadukone and Salman Khan attended the duo. Cricketer Sachin Tendulkar and his wife Anjali too made their presence felt at the function. If we pay any heed to gossip then it is believed that since Imran Khan was busy with his film shooting, he could not help Avantika plan the wedding. But their friend Karan Johar apparently stepped in and helped with the wedding preparations and was the unofficial wedding planner! For some of the ceremonies it was believed that Khan family's special chefs were flown in from Lucknow to prepare delectable meals. 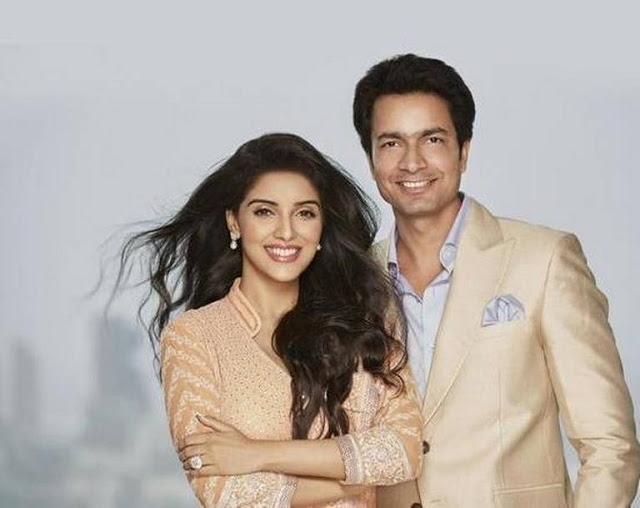 Asin has tied the knot with her fiance and Micromax co-founder Rahul Sharma in New Delhi on 19th January. The couple got married in an intimate ceremony at the Dusit Devarana resort in the capital. The wedding had taken place according to Christian as well as Hindu ceremony, honoring their respective religions. In an interview to Bombay Times, Asin revealed her story, “Just like my character Sanjana in the film (‘Ghajini’) faffs and makes up the story of being linked to Sanjay Singhania, that I met him first at the Mumbai airport, and that he said a hi and I said hi and how he came and sat next to me and then said I love you. My story is eerily similar to that. Rahul and I first met at the private airport of Mumbai as I was going to another country for work with Akshay Kumar for the promotions of Housefull 2." We exchanged ‘hi’s and went into the flight. All big stars have their friends accompanying them, so I assumed he was that friend. So Eventually, as the day unfolded, during the day I have realized who he was. I realized that it was actually, his flight, his tournament we were going for, he was sponsoring us and basically everything was happening because of him.” When Asin was in Delhi for an event, Rahul invited her to the Presidential suite of a luxury hotel. He had created a treasure hunt for her. At the end of it, she found Rahul dressed in a Kerala outfit. He went down on his knee and proposed to her. Since Asin is a Malayali, Rahul proposed to her in Malayalam. According to media reports, Rahul proposed to Asin with a 20-carat solitaire ring worth Rs. 6 Crores. The first card was for ‘the best man’ at the wedding, who is none other than Akshay Kumar, who played the cupid between the two. A big fat Goan Catholic Punjabi wedding ! was a fantastic day for her daughter. Raveena's parents were all present for the wedding. I even made the nightmarish mistake of watching a 'modern wedding' in Shaandaar. It scared the living daylights out of me and I thought I'd be scarred for life.But forget that. I managed to shake off the trauma and took off to Goa beautiful, serene laid-back, fun-tastic Goa for the "Papaji "of all weddings half-Punjabi/Sindhi and half Goan Catholic. 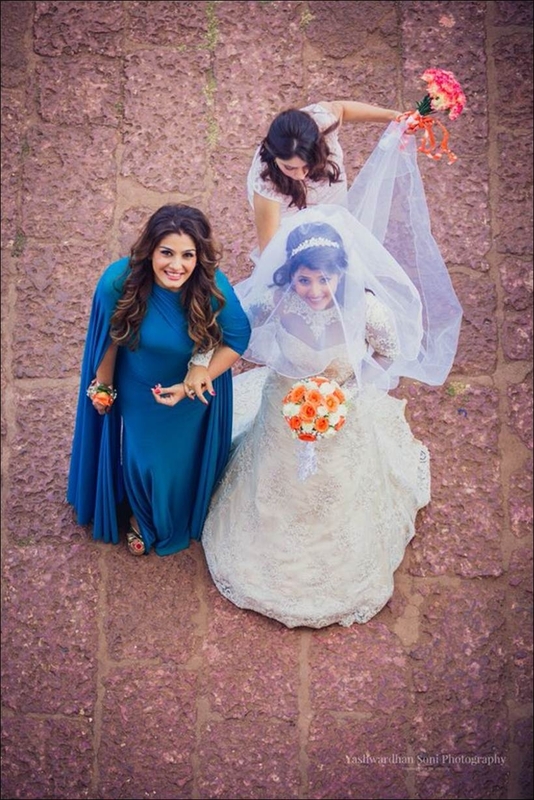 So, here is the lowdown on a big fat Goan Catholic Punjabi wedding ! I said the exact Auntyji words to them I once cringed at: 'Who's next at the altar' girls? Flashback: It's one of the most annoying things I have had to endure. with the conclusion that no wedding in the world could outdo a big fat Indian wedding. The decadent fun ,the drama, the madness and the glory, all makes us what we are. And let's not forget this particular one was a double dose of madness the Goans and the Punju/Sindhis! A beautiful culmination fusion of traditions and customs. The whole family had a wonderful time in Goa. The couple certainly had a dream wedding. this is what my glorious country is about. Post Your Comment for A big fat Goan Catholic Punjabi wedding ! the knot at Phagwara, near Bhajji's hometown in Jalandhar. that in public for long. parents run a convenience store. Bhajji and Geeta's love story began in the year 2007. when she was introduced to him through a common associate at an event. They clicked but had to be discrete. 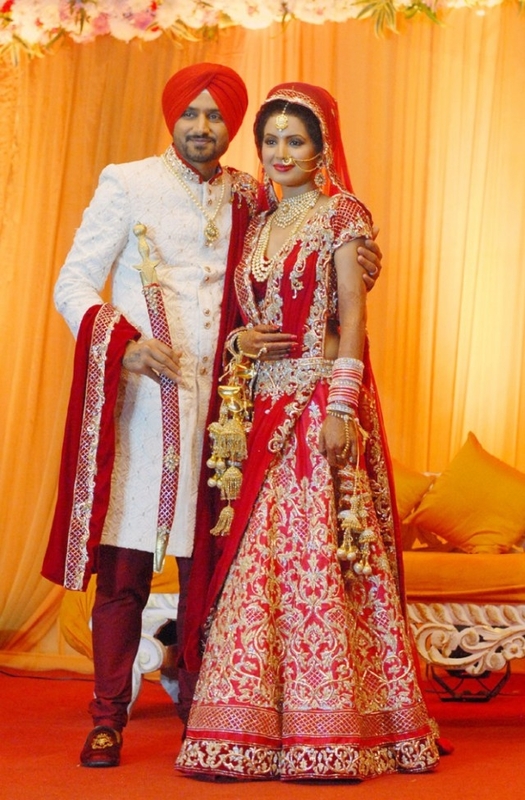 A day before the wedding Bhajji and Geeta Basra threw a lavish Sangeet ceremony for their family members and friends. Both Bhajjiand Geeta were looking lovely in their traditional attires. In an interview with PTI, Geeta Basra said "Harbhajan is a very strong headed person and that shows on screen (in matches) He got success at an early age and still he is so grounded and humble" He loves his game. I want to learn that from him." "I don't know if he has seen any of my films. We really don't discuss about films," Geeta told PTI. EASYSHADI wishes the couple, a life full of smile and blessings!